Electric cars are still a relative novelty in the new car scene, but the BMW i3 certainly makes a convincing case for itself. On top of being comfortable and spacious, the BMW i3 is also enjoyable to drive, has lots of oomph from its torquey electric motors and can go a good distance on a single charge. That’s not to say it’s a faultless machine, though. Refinement levels at higher speeds aren’t great, for instance, and there’s no denying the BMW i3 is an expensive car. However, if you have enough money and are looking for a compact vehicle that’s ideal for city commuting, we do reckon you should definitely consider the BMW i3 as your next new car. Electric vehicles have come a long way, especially in the last few years when Tesla has stepped up the game and nearly every other car manufacturer has tried to enter the competition. The BMW i3, however, does a great job at taking a leap toward not only Tesla but also pushing the market forward, almost challenging other carmakers to throw a little extra at furthering electric vehicle technology. The BMW i3 is truly a great car, but is it worth the price? The car is very tall, so it provides a lot of head room and plenty of leg room. Stepping into the BMW i3 is pretty easy. The car is very tall, so it provides a lot of head room and plenty of leg room. Even the back seats are spacious enough for a person who is six-feet tall. The BMW i3 allows access to the back seats through back hinged doors, and has one on either side. Like climbing into the front seats it’s also not difficult to get into. The BMW i3 seats four people comfortably. Even being made from recycled resources doesn’t stop BMW quality from stepping in. Each piece of the inside feels as high quality as any other BMW interior. In terms of styling, the BMW i3 is very unique and aggressive. In terms of styling, the BMW i3 is very unique and aggressive. Instead of a flat facing dashboard, it’s made of wood and horizontal with a dip just below the navigation screen. There are hardly any buttons crowding the dash beyond the infotainment screen, and the gearshift has been reduced to a knob that’s mounted behind the steering wheel on the steering column. There’s also no center divide underneath the dash going to the carpeting, so the car offers plenty of room for legs to stretch out. Trunk space is ample at 15 cubic feet, much more than the Chevrolet Volt’s 10 cubic feet. The BMW i3 will easily fit three or four medium-sized duffle bags, which is impressive for the car’s size. Another thing that’s nice about the trunk space is there is no lip that rises from the bumper, making it easier to load and unload heavier items. 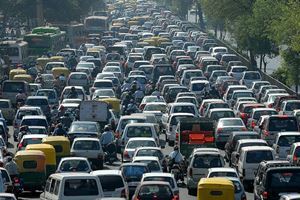 Due to the electric motor, the interior noise while driving around a city is almost non-existent. Despite being a more unconventional BMW, the BMW i3 is quite an entertaining car to drive. layout provides sharp steering and sporty handling. BMW has done what it can to make the BMW i3 lightweight, and that along with the car’s low center of gravity helps to create relatively impressive performance. Due to the electric motor, the interior noise while driving around a city is almost non-existent, and because it’s so spacious and with its gigantic windows, the BMW i3’s visibility is great. It’s quite a contrast to the Chevrolet Volt, which gets uncomfortable fast and visibility isn’t fantastic. Another area to take notice of is the regenerative braking system. One thing that isn’t so great in the BMW i3 is interior road noise on the highway. Another area to take notice of is the regenerative braking system. Once stepping off of the throttle, the BMW i3’s regenerative braking system will slow the car down automatically, which has been known to trip up some drivers who are new to the idea. It’s still impressive, because with this braking system and the relatively low speeds of city traffic the BMW i3 can confidently stop on its own while wading through crowded streets. 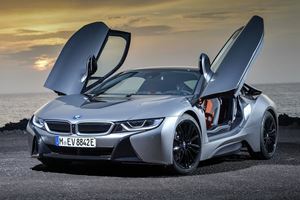 BMW also claims that the motor produced 170-hp and 184 lb-ft of torque. The base BMW i3 has an electric motor with a battery pack that BMW claims will last up to 81 miles per charge. 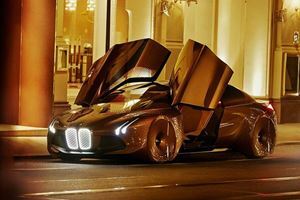 BMW also claims that the motor produced 170-hp and 184 lb-ft of torque. Buyers who want even more range can opt for a version that can last up to 114 miles on a single charge. However, charging times for this model does take longer: four-and-a-half hours for the larger battery setup, and three-and-a-half hours for the smaller one. The BMW i3 can also come with a 0.6-liter two-cylinder gasoline engine that works as an on-board generator when the batteries run flat. Those aren’t the only options available though, as the BMW i3 can also come with a 0.6-liter two-cylinder gasoline engine that works as an on-board generator when the batteries run flat. In this variant, the BMW i3 can travel up to 180 miles, though the battery charging time is still rated at four-and-a-half hours. As stated before, the power is almost instant thanks to the electric torque. The Nissan Leaf, another all electric EV in competition with the BMW i3, produces about 107-hp from its electric engine and gets around 100 miles to a charge, and against a car like the Chevrolet Volt which produces a total of 150-hp but only getting around 53 all electric miles to a charge, the BMW i3 can’t be beaten. It’s a BMW, which typically comes with a hefty price tag. The BMW i3 isn’t cheap. It is sporty, fuel efficient, comfortable and roomy but above all it’s a BMW, which typically comes with a hefty price tag. The BMW i3 certainly fits in the family, with its base price starting at around $42,000 for the battery-only trim. With the range extender, the price jumps not too much higher to around $47,500. 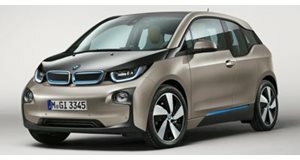 Couple that with the $2,350 Technology Package that features useful driving assists, and the BMW i3 clears $50,000 quite comfortably. This makes it much more expensive than any of the competition. The car closest in price is the Chevrolet Volt, base priced at around $34,000. The next all-electric rival to the BMW i3 is the Nissan Leaf, and that starts all the way down at almost $29,000. The BMW i3 has not yet been rated by NHTSA, but the car should be more than protective enough in a car crash. In terms of safety, the BMW i3 has not yet been rated by NHTSA, but the car should be more than protective enough in a car crash. The BMW i3 comes with a lot of features to make the car safer, including an emergency road side assistance service and an impact sensor that disengages the battery, starter motor and fuel pump while automatically unlocking the doors and and turning on the hazard lights. The BMW i3 also has a chassis made out of carbon fiber, which is stronger than a conventional chassis made out of metal. The BMW i3 is a step in the right direction for the electric car market, and while it is more expensive than every other car it competes against, it’s the choice we recommend if your budget stretches far enough. On top of the useful technology it features, the BMW i3 is also comfortable, sporty, compact and spacious. The fact that it provides such a solid package makes the higher price tag worth it if you can afford it. Its main competitors: Audi and Mercedes-Benz. Who else? At least it already has experience pumping fake engine noise into its M cars.